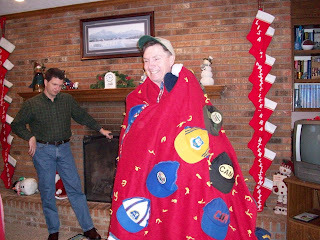 We had a fun Christmas here in Mississippi. 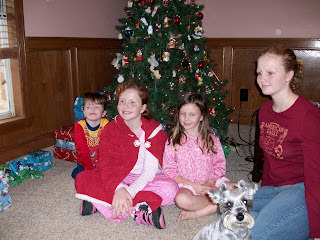 We had a lazy morning than kallee and the kids came over all excited to open more presents. Carter got a scooter, and a toy truck. Karlee, and Kara got a stuffed dog to play with. Krislee got an ipod. Then they all got piggy banks with some money in it to go to Disney World in January. 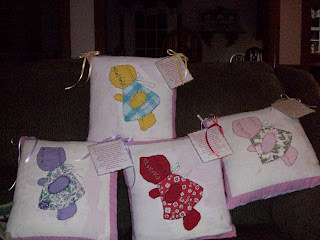 I made some pillows for the girls from an old blanket my grandma had made me. 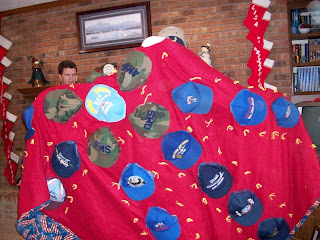 And I had this idea to make a blanket with some of Rich's hats. 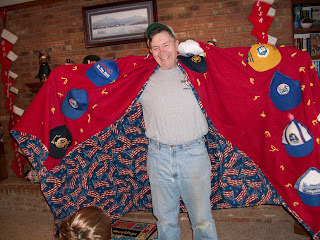 To say the least the blanket is unique. I hope everybody had a good Christmas. Hope this next year is a great one for everybody. We had our ward Christmas party tonight. It was cute and simple. We had a potluck dinner with the ward furnishing the ham, funeral potatoes and rolls. Kallee had me make the potatoes. We figured we would need 4 big pans. Needless to say we planned way to much. We had 12 bags of hashbrowns. We had 2 pans left over. We sang Christmas songs and the primary kids dressed up as Mrs. Clause read the Christmas Story Luke 2. 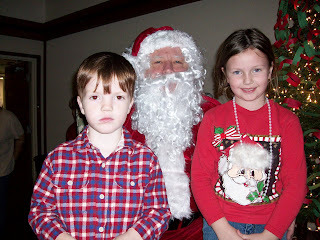 After, the kids got to sit on Santa's lap. 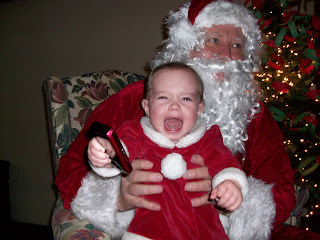 Here is a classic picture of Ellie sitting on Santa's lap. 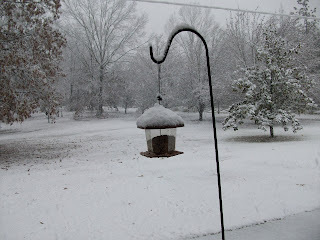 We had snow today. 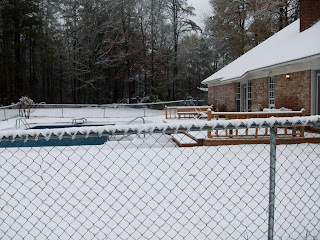 We received about 21/2 inches. 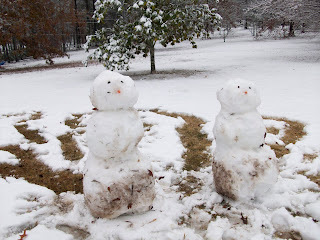 It was pretty wet, but I did get out and make 2 snowmen. Here are some pictures. For all of you in snow country this may not be much, but here in the south it is pretty rare. 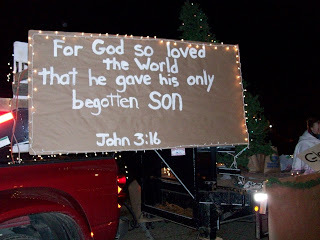 Our ward put a float in the Brandon Christmas parade. Kallee got this started last year. This year there were lots more people involved. 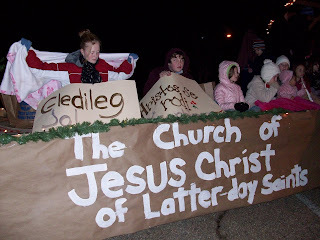 They taped candy to pass along cards, pamplets and passed out a few The Lamb Of God videos. It was fun to ride on the float and wave and wish people a Merry Christmas. People didn't boo us and were quite friendly. Living in the bible belt sometimes we don't get a good reception. We had cookies and hot chocolate after the parade. 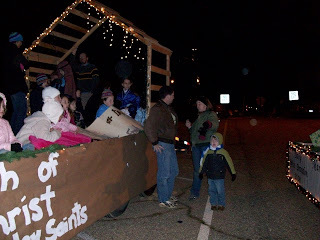 Here a a couple of pictures of our float. It is a night time parade so you have to have lights. 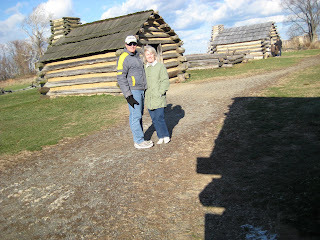 Last weekend we drove up to Valley Forge PA. It was about a 3 hour drive. The day was cold and windy. It was very interesting. We all know the suffering of the army there. But I didn't know that they got there training there, which helped win the war. About 2,000 people died there that winter. It was a perfect place that Washington picked to winter his army it was up on a hill and the British were only a days ride in Philadelphia. This way Washington could watch and see if they were coming to attack and be ready. 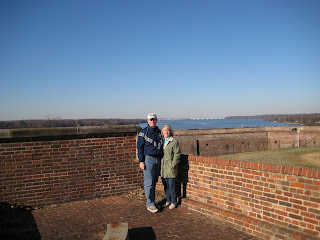 Then the next day we went to see Fort Washington. It is only 15 miles from here. It is right on the Potomac river with a straight shot to DC. So that is our fun weekends. During the week Rich goes to work then comes home and does emails. I go to the gym to my yoga classes and crochet. Here are some pictures of our week. Well we have been busy. 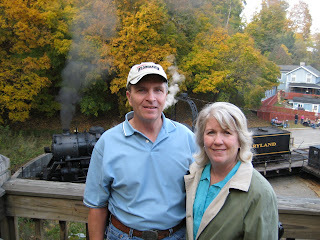 The first weekend I got to DC we drove up to Cumberland Maryland and rode the old steam train. It goes an hour up the mountain and ends in a little town called Frostburg. We got off and walked down the street to a Mexican restaurant. It was the first real date we have had in a long time. The colors on the trees were still pretty. It was a magical day. 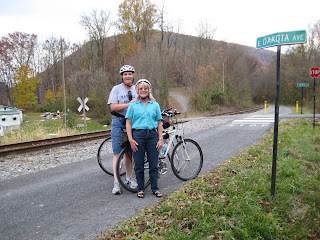 Then I drove rich up to Frostburg so he could ride the 16 miles down the trail that goes along the track. I rode up and met him. He zoomed down the mountain and I struggled and met him after 3 miles. It was a great day. 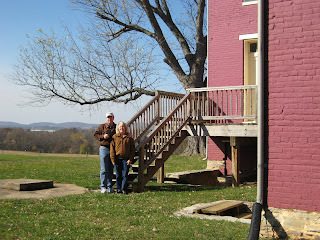 The next weekend we went and saw Dr. Mudd's house where John Wilkes booth stopped to get his leg fixed. It was very interesting and learned a lot about that event. It was a beautiful fall day. Then we stopped at a Red Robin restaurant and split a sandwich and onion ring. They have the best onion rings with a sauce of BBQ sauce and Mayo, It is quite yummy. 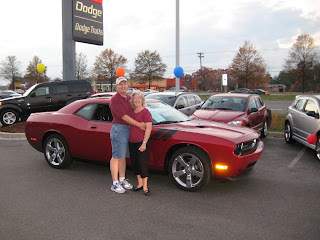 Then we stopped and tried out a new Dodge Challenger. I must say it was pretty cool. That will be our next dream car. We had a great day. 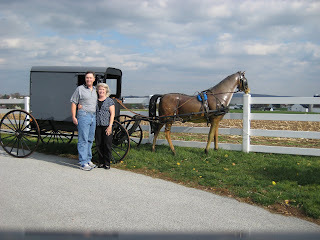 The next day we drove up to Amish country. That was a pretty ride. Such pretty farms and rolling hills. 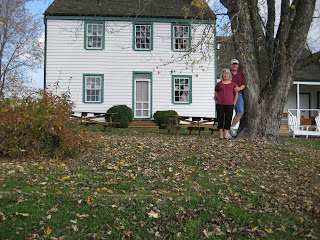 We went to Strasburg PA. There they also have an old steam engine train that goes 45 min through the countryside. We didn't ride on that, but we had a good time looking around the quaint town and shops. 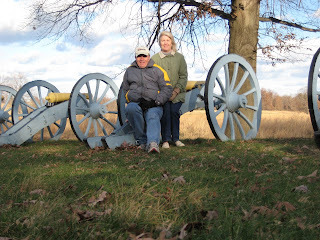 Tues on Veterans day we drove an hour up to Monocacy battlefield. It was interesting, and very pretty. So that has been what we have been doing, in between Rich's work and endless emails, and my thrift store shopping and crocheting. 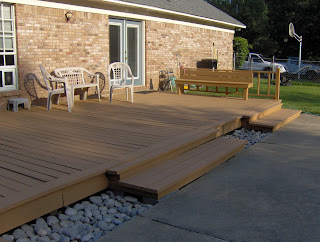 OK, I took Tiffini's challenge for a picture tag so here is mine. This is Carter at his second birthday party. What a fun time we had. It started on Sunday when Kallee and me and the 4 kids took off on our long drive to North Carolina to See the Biltmore Mansion. It really is quite huge. It took about 2 hours to go through it. Then the next day on to the beach. I had such a great time. I told Kallee we need to go on a trip every year with the kids. 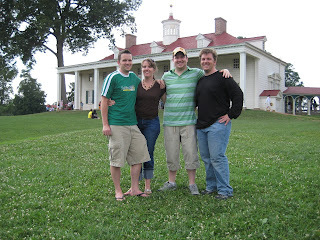 We got to DC on Tues night and Kory and Tiffini and Hailey and Kipp were there. 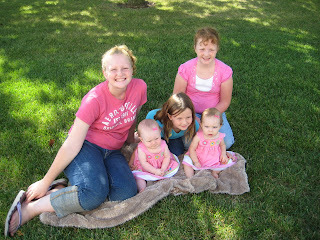 What fun to see them, and cute little Hailey. The next day we got up slow and had waffles which we had every morning. 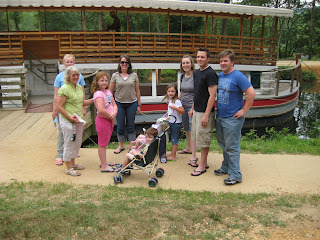 We went to Great Falls and rode on the canal boat. It was quite interesting going through the locks and being pulled by mules. We went to the Air Force concert but left early because we were tired and the music was different. Thursday we braved the metro and went down to the muesums, they are quite interesting, and it takes a long time to see everything. Kam and Lisa and Ellie came in on Thursday night. So of course they had to play a game of settlers. Friday we got a real slow start and went to walk the mall and see all of the monuments. I bet we walked at least 4 to 5 miles. But we saw the Lincoln memorial, Viet Nam Wall, World War II memorial, and the White House. Plus the capital from a distance. It is really quite a pretty city. Sat. 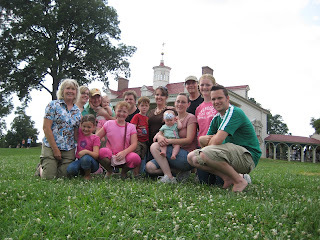 we went to Mount Vernon and had a good day there. Such a pretty place. Sunday Kallee left with the kids to go home. I miss them. Then the rest of us drove up to Gettysburg. It is such a pretty and peaceful place. The day was so nice, We stopped and got ice cream and fudge. Monday we took the metro again to downtown. We went to the Holocust museum. How sad that people can treat other people so bad. It was really interesting and made me think how blessed we are to live in a free country. Then we walked up to Ford's theater but it was closed, then to the spy museum. Tues we went to Arlington Cemetary and the tomb of the unkown soldier. Then we stopped at the huge mall by the airport and got something to eat, then sadly to the airport. 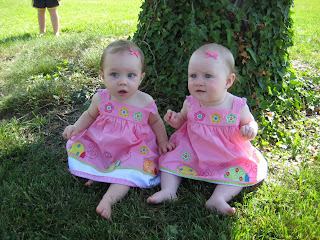 It was Christmas in July and that was the best present I had with the kids on a real vacation. Next stop Disney World. I can't wait. Last weekend we went up to York Pa. It was about 2 hours away. We took the red Fairlane up to the National Fairlane club car show. It was really quite fun. Almost 150 cars and they were all some form of Fairlanes. Different years and convertibles ets. Sat. was the show. So all the people that were registered got to vote for their favorite cars. They had several catagories. We had a fun time looking and voting for the cars. It was hot so we walked over to the movies and saw Hancock. It wasn't as good as I thought it was going to be, but we had fun. Went to Subway and got a pizza. I think they are pretty good. That night they had the awards. We were pleased to win 3rd in our catagory. They really do have some pretty cars. So now I am back in Miss. and Rich and Katie are in Dc. In just about 2 weeks we will all be there. Yes they actually ferry cars across. It is $4.00 one way. I guess that all of you think that this is all daddy and I do. But we enjoy it. We did on thurs go to a ball game. It is a minor, minor, league. It was fun and they hit the ball a lot. One inning lasted almost an hour and it seemed like we were watching little league. But the atmosphere is fun and the weather was nice. We went on a bike ride on the 4th. This week we are going up by Gettysburg to the Fairlane club car show. Maybe we will win a trohpy. Then Sunday I am going home to Mississippi for a couple of weeks then drive back up with Kallee and get ready for our family reunion. 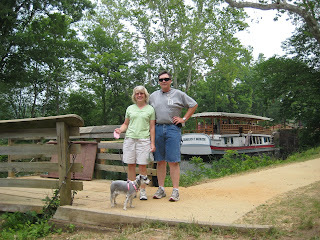 We went on a bike ride Saturday on the canal trail. It is such a fun ride. The trail is pretty level so it makes for an easy ride. It is also unpaved. On the way back we got caught in a thunder storm. To say the least we were pretty muddy by the time we got back to the car. Luckily we had brought a change of clothes. Ok. Here is one for you. 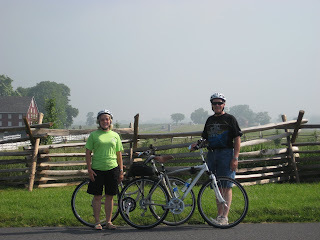 We went on a great bike ride last night at Great Falls. It takes about 45 minutes to get there. It is along the canal and since it was a week night not too many people. It is a pretty even trail, so we are just riding along. Bikers pass us, a jogger passes us, so daddy said the next time we go to the bike shop he is going to ask them why are bikes don't go as fast as the others. Anyway we had a good time and took a picnic. We had a fun weekend. 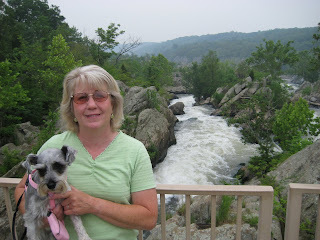 We went to Great Falls National park. 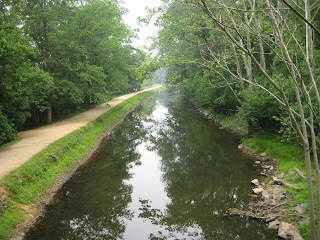 It is all along the old canal. They have a boat you can ride on that gives you an idea how going through the canal locks are. It is pulled by mules. 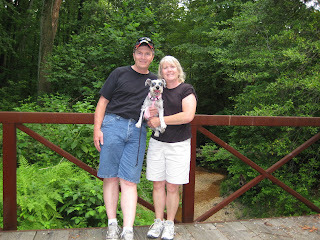 We went to Gettysburg on our weekly bike ride, and a nice woods walk on base. Thanks to Lisa now all of our family will know what we are doing. We sort of have a crazy life going on. I am back in DC with Papa. It feels familiar and I am glad to be back with Rich. Yesterday Sat. June 7 we got up and drove to Gettysburg which is only about an hour and half. Rode our bikes. It was fogging but there is such a quite feeling there. Even when there are crowds of people. Rode into town and got pancakes at the Lincoln diner. Then rode back up to the park and the car. It is hilly so at places we got off and walked. Then we drove about 28 miles up to Carlisle PA, to the all Ford National car show. Tons of cars all of them Fords. Not too many Fairlanes our year. But it is amazing how much money people put in to them. They had old cars, newer cars. Anykind of Ford you would want to see. It was a very hot day. Probably in the high 90's, so we were glad to get back to the air conditiond car. 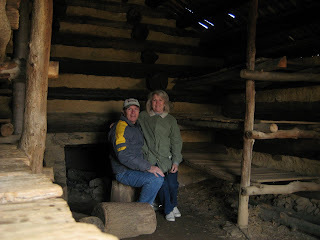 Rich and I both love going to Gettysburg. 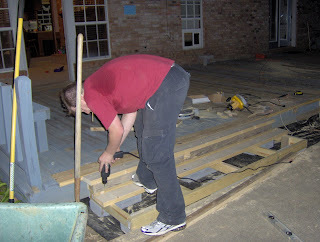 Before I came up here, Kam and I had our huge project the deck to finish. We did finally did. 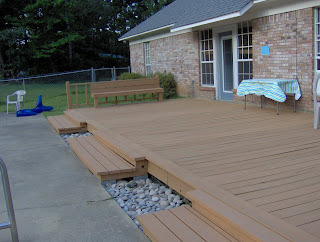 Kam worked hard and many long hours working on it. But I love it so much. I painted it a cedar color. Even though we left a lot of the old boards it still looks pretty good. So I have to give a huge thanks to Kam for working so hard.